September's parade of mediocrity continues with the three wide releases this weekend, although as with last weekend, a couple films have some box office breakout chances. Just hang tight, people. We're only a week away from the good stuff! 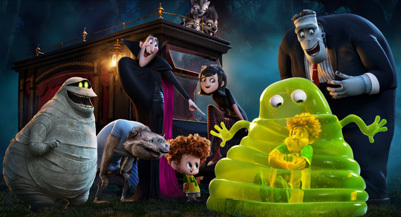 The raging dumpster fire that is Adam Sandler's recent career is highlighted with the release of Hotel Transylvania 2 – a sort of “this is where you stand now” statement – the sequel to the modestly regarded animated film from 2012 featuring him as Dracula and the leader of a refuge hotel for a group of famous monsters, Frankenstein, The Mummy and what-have-you. Into this was introduced a normal human, voiced by Andy Samberg, stumbling into the hotel and apparently not realizing anything was amiss, then falling in love with Dracula's daughter Mavis, voiced by Selena Gomez, because teen audiences. The sequel brings everything back plus a baby, which leads to panic and anxiety, as there's the question of whether a half-Dracula/half-human will be a vampire or not (and I don't even want to get into the biology of this, it's just...), and also might lead Mavis to leave the hotel for the temptations of the real world. Because this is an animated film aimed at pre-teens, this mostly involves slurpees and dance parties. Woo. Directed by legendary animation director Gennady Tartakovsky, of Dexter's Laboratory fame, this film seems to highlight the difficulty of either his style translating to 90 minute features, or of Adam Sandler's style translating into comedy anymore. Given that Sandler has that screenwriting credit, I know which horse I'm betting on. The original film opened to about $42 million, but I can see a bit of a slide given Sandler's recent fall off in popularity (I'd mention Samberg's rise in popularity, but he seems to barely be in the advertising for this), especially with this summer's Pixels, which took a golden premise and destroyed it. With no critics' screenings, we're left a bit in the dark about the quality of the film, but let's just say that's never a good sign. Give it about $35 million this weekend from unsuspecting parents. Pity them.